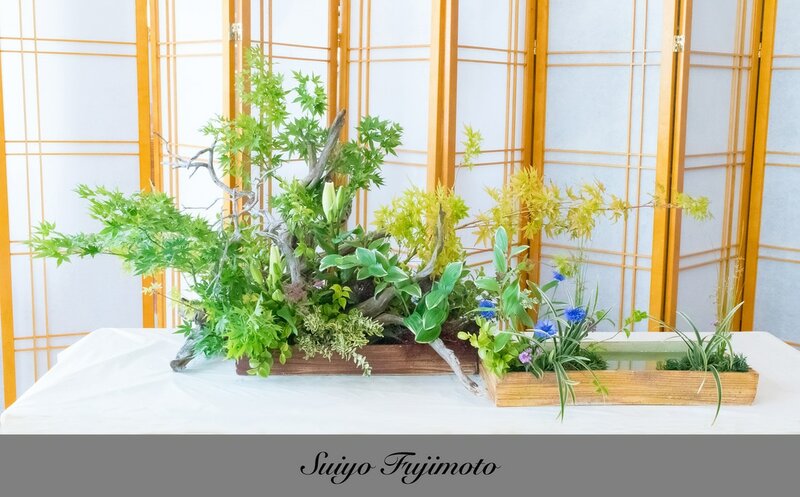 Ohara School ikebana is distinguished by its respect for floral materials in their most natural forms. Plant materials are incorporated into sophisticated asymmetrical designs with the use of "empty" space as an essential feature of the composition. Harmony among the materials, the container and the setting is crucial. This is the context in which the art of flower arranging exists. The varying forms of ikebana share certain common features, regardless of the period or school. Any plant material, branches, leaves, grasses, moss and fruit, as well as flowers may be used. Withered leaves, seedpods and buds are valued as highly as flowers in full bloom. While a work may be composed of one or of many different kinds of materials, the selection of each element is vitally important in the quest to create a composition that honors the materials by presenting them even more beautifully than they would have been in nature. Ohara School had been the vanguard of the advancement of ikebana. In the late nineteenth century when Japan opened itself to the influence of Western culture, Unshin Ohara founded the Ohara School. His creation, the Moribana Style, using wide, shallow containers revolutionized ikebana forever. His son, Koun, organized the teaching of ikebana, even teaching on the radio. His son, Houn, the longest serving of all ikebana headmasters, went on to develop arrangement styles based on the intellectual concepts within Japanese and Chinese painting, Rimpa and Bunjin Arrangement, respectively. His son, Natsuki, developed the contemporary styles and forms that ushered in the new century and his son, Hiroki, promises to continue the innovation for the 21st century and beyond. The Ohara School is historic and progressive in aesthetic thought and development of the fine art of flower arranging ~ ikebana. What distinguishes Ohara ikebana from simpler decorative approaches is its asymmetrical form and the use of "empty" space as an essential feature of the composition. A sense of harmony among the materials, the container and the setting is crucial. 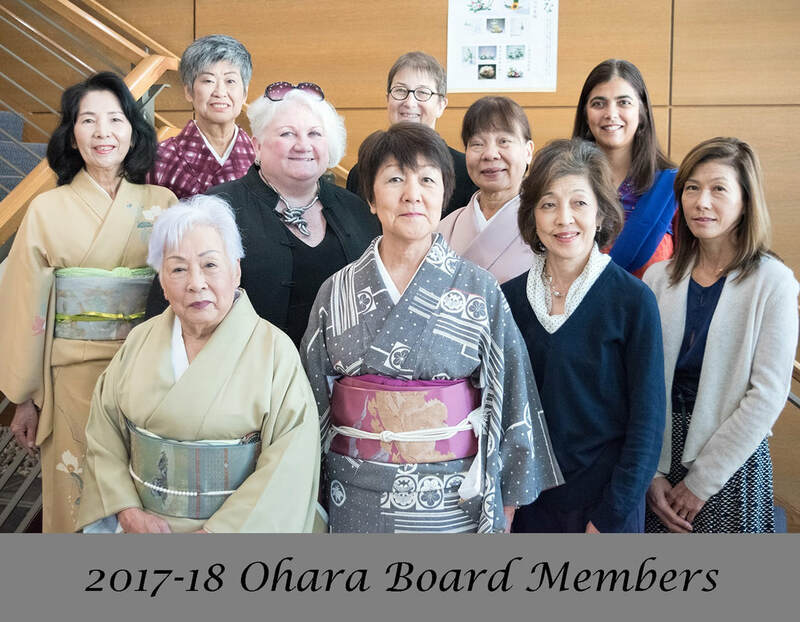 The Ohara School of Northern California Chapter was founded in May 1964 upon the visit of Headmaster Houn Ohara to San Francisco. Accompanying him were Ms. Wakako Ohara and Professors Taium Goshima and Koshu Oda. They were received by fifteen eager members including seven teachers from around northern California, thus the name became the Northern California Chapter. The officers were appointed by Headmaster: the late Koshun Tanaka, President; the late Hokei Kajiwara, Vice President; and Suiyo Fujimoto, Treasurer and Corresponding Secretary. The first workshop was held in the Hall of Flowers in Golden Gate Park led by Professors Goshima and Oda. In September of 1966, only two years after founding Headmaster Houn returned to San Francisco in a chartered airplane named "Ohara" after touring the United States to conduct workshops and demonstrations. San Francisco enjoyed his demonstration and hosted an exhibit of more than 50 dazzling arrangements in his honor and for guests to enjoy. Over our history we have hosted third Headmaster Houn Ohara again in May 1979, fourth Headmaster Natsuki Ohara in May 1984, late Professor Kazuhiko Kudo, Chairman Emeritus of the Ohara Council of Professors in 1989 and Professor Kayoko Namba, retired VP of the council of Professors in 2006. In 1974 we were incorporated as a California non-profit organization. In 1984, the late Houbi Hayashi branched out to begin the Monterey Chapter followed by Mrs. Yasuko Yamauchi who formed the Sacramento Chapter in 2000. President Maruyama oversaw our 50th anniversary celebration in 2014 at the Jodo Shinshu Center. The chapter remains active and vibrant with monthly workshops and frequent exhibitions featuring demonstrations and many arrangements by members for the public to enjoy. High-level teachers also demonstrate around the Bay Area at various venues such as the Asian Art Museum, the Cherry Blossom Festival in San Francisco's Japantown, and for Ikebana International as well as many others.